This year, we did our homework and refined the whole mid-range bike line, cleaning up many of the details to make them better than ever, and give you more value for your money! First up, we got rid of the two-piece steer tube fork and upgraded it for a hydroformed 1-piece steerer tube. Forks are the one area you shouldn’t cut back on, and we felt this was definitely a major improvement! Along with the fork upgrade, we have given these bikes a Trebol headset, a stronger 510 chain, bigger bars and a taller standover height, improving the overall look and feel, and since we have never been a fan of pinch bolt cranks, so we are happy to have upgraded to the clean Trebol Bueno cranks on all our bikes, including the Electron! The Electron was built for the rider on a budget, designed for all kinds of terrain and built with many of the same improvements and upgrades as our Neutron and Proton completes. The 2019 Electron doesn’t ́t look any less amazing than our more expensive models, saving you money while still getting a high quality bike right out of the box! Same as last year, the Electron comes with the Trebol 2.35” tires, Electron Tripod seat featuring original artwork, the timeless Roey signature grips, Ruben signature graphite pedals and a 20.5” top tube length to make this one of the best spec’d, common sense complete bikes out there. 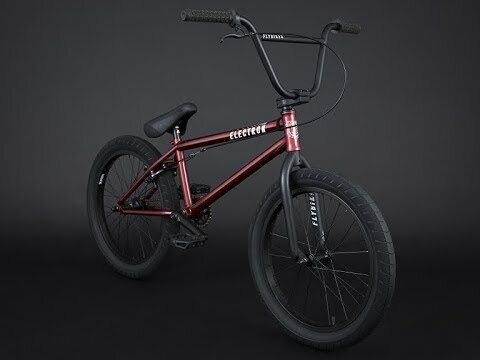 The 2019 Electron is available in two new amazing colorways; Flat Black and Gloss Metallic Red, to help create one sweet ride at an affordable price that’s ready to shred right out of the box.